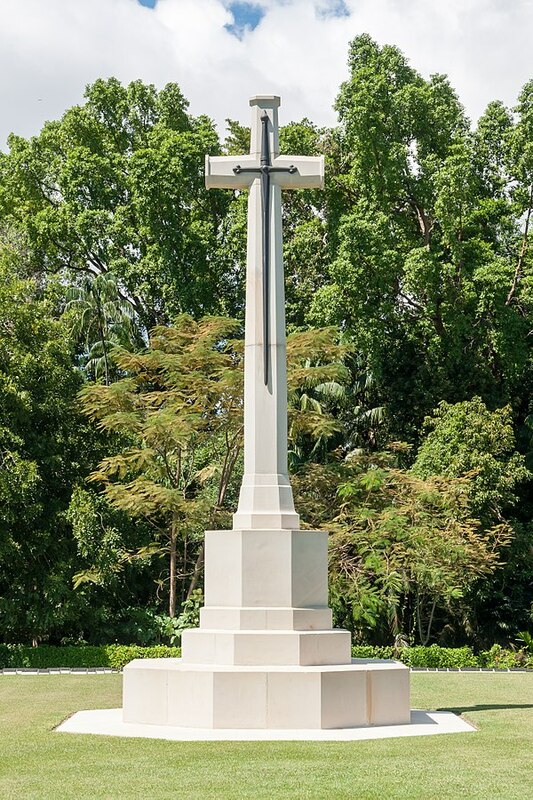 The Cross of Sacrifice pictured right is a standard feature of all British Commonwealth War Cemeteries throughout the world. It was designed shortly after the 1914-1918 War. Prior to WW1 no nation had systematically cared for its war dead – in fact, throughout the ages only the graves of the Great Commanders received any recognition. During WW1 the Imperial War Graves Commission was created as a permanent organisation to safeguard for all time the remains of our gallant dead, wherever they might be. As time passes, very few know those who gave their lives. This is an attempt to show that the men and women, on the St Michael’s and North Merchiston memorials, once lived their lives in the same houses, in the same streets, as others do today. The Commonwealth War Graves Commission (‘CWGC’) is the official reference source of Commonwealth military personnel who died in conflict since the 20th century, although only basic information is held in their database. In the 1980’s a member of a church in the Viewforth area, Gordon Taylor, started researching the names on the memorials of all churches in that area. As a development of his significant interest in military medals, Gordon had researched the backgrounds of many of the holders of these medals. 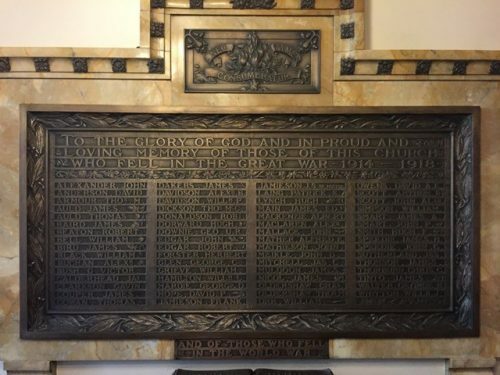 In parallel with this, he had researched the backgrounds of many servicemen who died in the major conflicts of the 20th century, so that a human story could be attached to the names which appear on the war memorials. 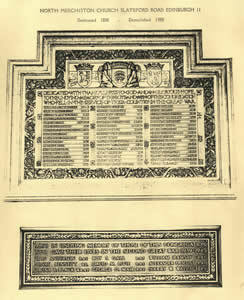 This research was achieved by focusing on a small group or groups, and one such group comprised those whose names were found on the war memorials of the three main churches (Viewforth, St David’s and St Oswald’s) which existed in the locality of Gordon’s home in the Viewforth area of Edinburgh. Although two of those church buildings have now closed, all the memorials are preserved. Our sincere thanks go to Gordon who kindly offered to research the names on St Michael’s & North Merchiston memorials, together with biographical details and photographs where available. The images left were taken at Labuan War Cemetery, North Borneo. The land on which the cemetery stands is the gift of the people of that country for the perpetual resting place of the sailors, soldiers and airmen who are honoured there. North Merchiston Church was situated at the corner of Slateford Road and Hermand Crescent. It was demolished in 1988. 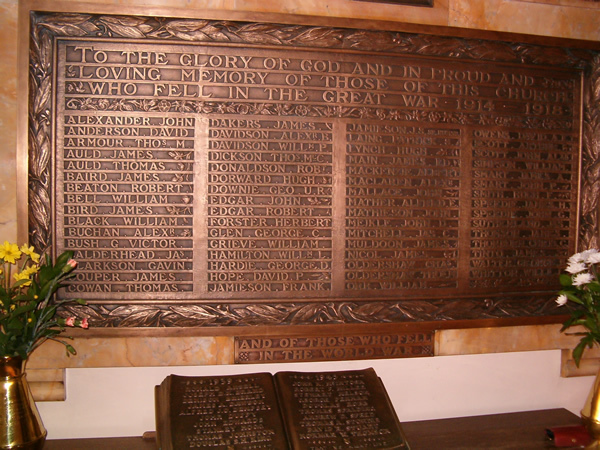 Unfortunately the War Memorial did not survive when the church was demolished. Only an old print of a photograph remains. Rev. W. H. Kilpatrick was minister there during the first World War. His son, Robert died during this conflict and his name is on the memorial. “Memorials of Gorgie Mission and Faith Church” which was published in 1899 states that Rev. Kilpatrick was ordained in 1891 and became minister of Gorgie Mission, during which time they were strongly recommended to build a new church in a prominent site in Slateford Road. This was completed in 1896 and became known as North Merchiston Church. Dedicated with thankfulness to God and in glorious hope to the undying in memory of the boys and men of this congregation who fell in the service of their country in the Great War. Also in undying memory of those of this congregation who gave their lives in the Second Great War 1939-1945. 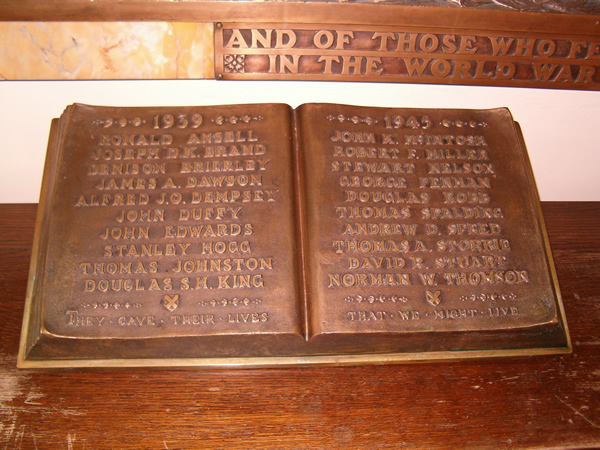 On the left are images of St Michael’s Memorials to those killed during both World Wars – 1914-1918 and 1939-1945. On the wall in are the names of those killed during WW1. 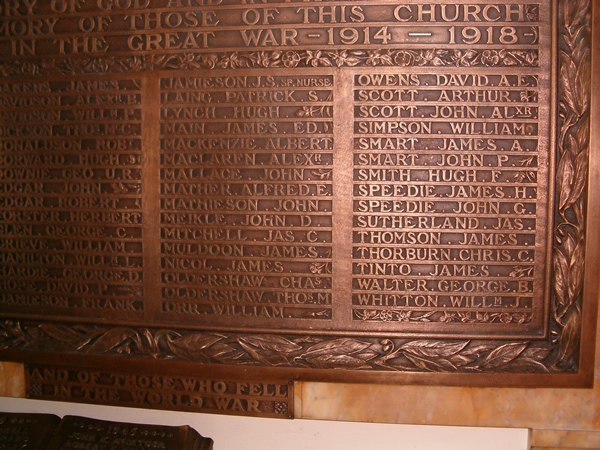 We have also photographs of each side of this memorial to make it easier to view the names. On the table in front is the memorial to those killed during WW2. Our database went on-line in time for Remembrance Day 2005 but research is always ongoing. We would be extremely grateful if anyone can send us whatever little information they may have on any of the names – street where the person lived, regiment, or school attended. Simply Contact Us and let us know. Sometimes it only needs one small detail to allow us to confirm a name.